FROSTS PHARMACY LTD trading as OXFORD ONLINE PHARMACY is a company registered in England and Wales under company number 06507149, whose registered address is at Apollo Business Park, Unit 7, Ironstone Lane, Wroxton, OX15 6AY, United Kingdom, hereinafter referred to as ‘OOP’ or ‘We’ or ‘Us’ views complaints as an opportunity to learn and improve for the future, as well as a chance to put things right for the person or organisation that has made the complaint. Frosts Pharmacy Ltd - General Pharmaceutical Council (GPhC) Registration no: 9010442 with a registered premises address at Oxford Online Pharmacy, Apollo Business Park, Unit 7, Ironstone Lane, Wroxton, OX15 6AY, United Kingdom. A complaint is any expression of dissatisfaction, whether justified or not, about any aspect of Oxford Online Pharmacy. 3. in writing to Oxford Online Pharmacy, Apollo Business Park, Unit 7, Ironstone Lane, Wroxton, OX15 6AY, United Kingdom. We will do our utmost to resolve any issue you may have. This policy does not cover complaints from staff, who should use Oxford Online Pharmacy’s Disciplinary Policy and Grievance Policy. We will send you a written or emailed acknowledgment of a complaint within 3 business days. - a response which: explains why We are still not in a position to make a final response, giving reasons for the delay and which indicates when We expect to be able to provide a final response followed by. If You are not satisfied with our response, or a complaint is not resolved after eight weeks, You may refer the complaint to The General Pharmaceutical Council. We reserve the right to decline to consider a complaint that is made more than 12 months after You become aware of the cause of the complaint. There may be instances where We will waive this requirement at our discretion. We will confirm to You in writing if a complaint has been made outside the time limit that We are prepared to consider. 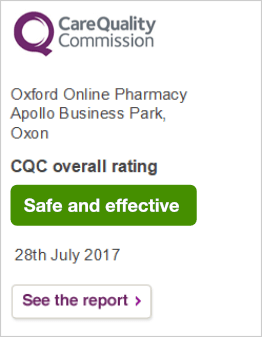 Thank you for using our online platform at www.oxfordonlinepharmacy.co.uk (the ‘Site’). Unless otherwise indicated, all definitions used in the Service Terms & Purchase Terms shall apply to this Accessibility Statement (‘Statement’). FROSTS PHARMACY LTD trading as OXFORD ONLINE PHARMACY is a company registered in England and Wales under company number 06507149, whose registered address is at Apollo Business Park, Unit 7, Ironstone Lane, Wroxton, OX15 6AY, United Kingdom, hereinafter referred to as ‘OOP’ or ‘We’ have created this Statement in order to demonstrate our commitment to making the access and use of this Site and the Services accessible to all. In this Statement, references to ‘You’ and ‘Your’ are references to the registered Customer or a non-registered Visitor. Frosts Pharmacy Ltd - General Pharmaceutical Council (GPhC) Registration no: 1035893 with a registered premises address at Hardwick Shopping Centre, Ferriston, Banbury, Oxfordshire, OX16 1XE, UK. We reserve the right to modify this Statement at any time without notice by posting the changes on this page. If You have difficulty using this Site, You can send us an email about the Services that We offer. If You would like information and advice You can e-mail us by clicking on this link https://www.oxfordonlinepharmacy.co.uk/contact Please include name, email address and telephone number if you would like a response.] and a full description of Your query. A. Web Content Accessibility Guidelines (WCAG) 2.0.: These are guidelines for making Web content more accessible to people with disabilities, including blindness and low vision, deafness and hearing loss, learning disabilities, cognitive limitations, limited movement, speech disabilities, photosensitivity and combinations of these. If You have a visual impairment or dyslexia, You may find making changes to Your web browser settings help You use this Site. You can change the options in Your browser to adjust the size of the text, the colour of the text and the colour of the background. If You are using the latest version of Internet Explorer, You will be able to override the colour scheme of this and many other websites. • once You have filled the form in, turn Virtual PC Cursor back on and check what You have entered and then submit the form. • to change just the size of text go to 'View - text size' and choose the setting You are most comfortable with (largest, larger, medium, smaller, smallest). You may also find it useful to change the default colours and fonts used on Your computer. The procedure for doing this is different for different versions of Windows and other operating systems. You should therefore consult Your Computer’s Help facility for instructions on doing this. Further information is available from AbilityNet's 'My computer my way' website - see http://www.abilitynet.org.uk/myway. Lots of information about issues relating to sight loss and accessibility. We keep our Statement under regular review. This Statement was last updated 20th January 2017. Thank you for using our online platform at www.oxfordonlinepharmacy.co.uk (the ‘Site’). Unless otherwise indicated, all definitions used in the Service Terms & Purchase Terms shall apply to this. FROSTS PHARMACY LTD trading as OXFORD ONLINE PHARMACY is a company registered in England and Wales under company number 06507149, whose registered address is at Apollo Business Park, Unit 7, Ironstone Lane, Wroxton, OX15 6AY, United Kingdom, hereinafter referred to as ‘OOP’ or ‘We’ have created this document to warn You about the risks inherent in self-diagnosis, the use of certain programmes and to remind You about electrical products. In this warning notice, references to ‘You’ and ‘Your’ are references to the registered Customer or a non-registered Visitor. • on a rare occasion, be fatal. You should check with Your GP before You purchase any Products to undertake any specific programmes such as weight loss or smoking cessation. Electrical Products sold on this Site such as toothbrushes and blood pressure machines are designed for ‘proper’ use i.e. as set out in the accompanying instructions and are for the UK market and if supplied with a power adaptor, it will therefore be fitted with a UK plug. You should read all accompanying instructions that come with the Product in full before any use and observe any specific warnings given by the manufacturer.